ATTENTION: CONSTABLES IN OUR PRECINCT NEED YOUR HELP! As a member of the Civil Advisory Board, Constables Precinct 3, I have learned a great deal regarding the daily workload, the type of work and services provided, and the staffing needs of Precinct 3. Through actual participation in shifts, jobs and daily activities within the precinct and on the streets, I have gained a much greater understanding exactly how difficult the officers jobs are on a daily basis. They provide a service to our community that is immeasurable in terms of quality of life, sense of security, increasing our overall safety, providing much needed traffic patrol and school zone patrol, warrants service and so much more. Here’s the problem, the Constables face a potential cut in staffing of 3 officers for FY2016. The budget is currently being reviewed in work sessions by the commissioners of Bexar County and Judge Wolff. The budget will be finalized by September 1, 2015 for implementation beginning October 1, 2015. If we lose 3 officers from the Constables office, as a result we lose a great percentage of our coverage and services. * All PCT 3 efforts are offset by incidental traffic or warrant fine revenue, bringing in 2-3 million a year, well over the cost of providing these services. HOW TO HELP AND TAKE ACTION: Please email and/or call Judge Wolff and Commissioner Wolff to support our Constables request to maintain our current staffing at the very least and allowing the budget to be reflective of the tax dollars we (tax payers of Precinct 3) provide to it. The Constables produce enough revenue to completely offset their entire overhead budget…and as a taxpayer that makes terrific sense. They have earned our support to continue providing necessary services to our community. There are also technology funds in their operating budget n jeopardy of being severely downsized. These funds are essential to providing body cameras, radio improvements, car cameras that protect your officers and taxpayers from frivolous lawsuits, and Automatic License Plate readers that allow us to capture wanted felons, family violence offenders and DWI fugitives by scanning license plates and these devices allow more work with fewer officers, which is the less expensive option to just adding more staff. Those funds should be restored as well. As we continue to grow in north Bexar County, the need for law enforcement presence will continue to grow. The sheriff, our other area law enforcement option, does a good job but they cannot possibly cover our growing area on a regular basis given the need for them to be spread over the entire Bexar County area filling a variety of needs. You are all aware that Timberwood being non-annexed means we have no city services including SAPD. As neighborhoods around us continue to be annexed, it will become more and more important for us to maintain our current level of service with the Constables in order to maintain our quality of life in the future. Today, in the Express News a front page article ran describing the pay raise to Commissioners of the Bexar County Courts while they are reviewing the potential of cutting services of law enforcement to our area? Does that sound like a good reasonable plan? I also understand there is ample money in the budget to maintain our services, especially with the increased tax revenue due to property valuation increases. Last week, I sent a letter to the commissioners court in support of our Constables and would be happy to share it with you if you want the detail. Just send me a message and I will forward it to you. I have provided the facts above to assist you in crafting a personal response should you choose to help out. The Constable’s office needs your help! Please send an e-mail to both Judge Wolff and Commissioner Wolff letting them know how much you value your current Constable services and the protection, service, quality of life and sense of security they provide to our area. Judge Wolff can be reached at nwolff@bexar.org and Kevin Wolff can be reached at kwolff@bexar.org. Every message you send counts and may be the difference in whether or not we receive cuts in our services versus maintaining what we already have and deserve. Questions? Let me know how I can help answer them! In case you missed the e-blast sent out late last week by Spectrum/TPOA Board, there is a vacancy on our HOA board. If you or someone you know in the neighborhood is interested in serving, please let Spectrum know of your interest by close of business today according to the e-mail sent out. I would like to think that if someone in the neighborhood is interested in pursuing the spot, they would have a little latitude to let Spectrum know in the next day or two of their interest. It’s a great chance for you to serve your community as a volunteer! WHAT’S THE LATEST IN TIMBERWOOD? * I provided you with an update on the Slumber Pass/Blanco light a while back. Please read previous post for specific information that is currently available. Still looks like fall before the actual construction will take place. * Speeders along Slumber Pass and Timberline continue to be a problem. * Concerns were raised about the growing attendance at social events in the park and subsequent problems that are resulting. One such problem required the need to call police in to resolve it, and discussion was held about particularly curtailing outside advertising of some of the “higher profile” events on outside web pages, etc. which denote the location of the event and bring folks who may not be Timberwood residents in to enjoy the events. Board has hired security for all the future events going forward and is planning for additional security to be in place for those events. Brief discussion was held about how to manage the size of the events in the future and ensure that Timberwood residents are attending rather than others. * A discussion was held regarding interest in possibly adding batting cages to the park for an additional activity for the residents to enjoy. The property owner interested in pursuing this option was tasked with providing additional information like cost, etc. to determine if this might be something that could be undertaken in the future. Note was made that a board member has resigned. The board is looking for a potential replacement. If you are interested in applying for the spot, contact timberwoodnews@gmail.com or contact@spectrumam.com to provide them with your interest. There was a discussion of the treasurers report and collections which provided attendees with a snapshot of how our financial position looks at this time. Gate Issue – There have been problems with gate access involving the keypads and gate communication for both the park and the pool area. A review of the current system revealed it is obsolete and will need to be replaced. Discussion was held about that project and there was a subsequent approval for the replacement project. Bridge across the lake between the pavilion and playground: A problem has arisen with the railing on the bridge and it’s stability. Spindles are being removed and thrown into the lake and the railing has become somewhat less stable in-spite of regular maintenance and repair. A project to replace and upgrade the railing and spindles was discussed with subsequent approval of the project. Social events were discussed with upcoming events noted. Outside restroom facilities project was discussed and it’s now moving along. The hope is that the project will complete before the Halloween event takes place. That facility will be located over by the tennis courts and kids playground. There is an Eagle Scout project underway marking our fire hydrants for easy visibility in the evening for fire crews who might be needing to identify locations of same. Notice the blue markers in front of some of the hydrants near you? Those are ones the Eagle Scout has identified and marked appropriately. Discussion about Timberline/Borgfeld entrance damage took place with further discussion about steps to repair and correct the damage. Discussion about the fire station that will be going in at Canyon Golf and Overlook Parkway was held with a discussion about the potential annexation of areas surrounding Timberwood still underway and what that might do to funding and revenue in the future to support services. There were about 40 residents in attendance at the meeting. 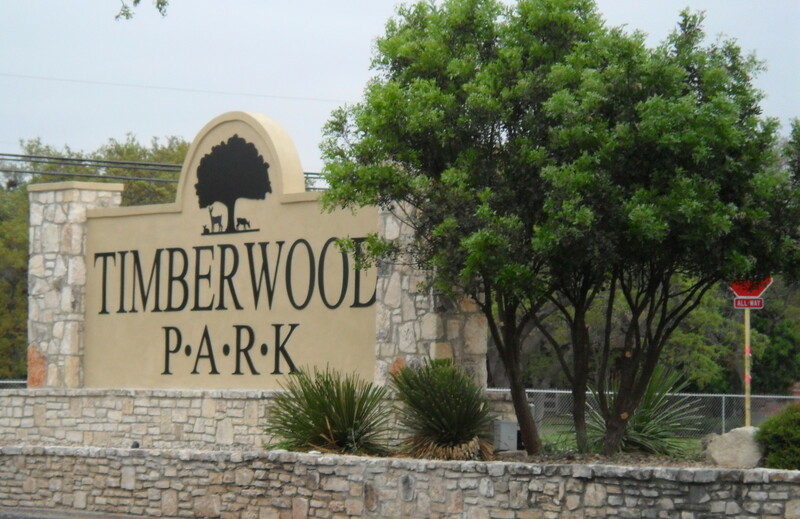 NOTES ABOUT ANNEXATION/NON-ANNEXATION: The magazine San Antonio Neighborhoods lists Timberwood Park as one of the top 10 places to live in our area. Citing several of the biggest reasons– the country setting with large 1/2 acre treed lots and wildlife in abundance, as well as the non-annexation agreement which was put in place back in 2006 protecting us from city taxes. You can read more about that agreement on Timberwood Park Web Site . As the city continues to move toward annexation of some of the high-end neighborhoods around us, we become more isolated in terms of how services will be provided to us and what revenue will be available to support those services. It is really important for residents to pay attention to the discussions about annexation and how it may impact us directly. As I reported in this blog about 3 posts ago — June post —- it is going to be important to ensure our fire stations ….Borgfeld Road and the one now having ground broken for shortly on Overlook Parkway — remain in our Emergency Service District and able to provide us services. If the city chooses to annex the areas around us, does that also mean they will annex the newest fire station which will be built to support this area? I urge you to pay attention to what is happening around us and how it might impact our quality of life. Voicing your concerns to elected officials is a great way to make sure our voice, in Timberwood Park, continues to be heard and responded to. Thanks for subscribing. If you think your neighbor would be interested, let them know to subscribe to the blog and receive these messages as they are posted. Visit www.timberwoodparksa.org and click on Blog. Then click on the “subscribe” button on the left after you add your email address!